How Much Does It Cost to Move from the UAE? Check out the following list of 33 common destinations across the globe and the associated approximate costs of moving from the UAE. ServiceMarket has made it easier than ever before to find licensed international movers in Dubai. If you need help with finding the most suitable moving company, just share some details with us or take a look at our list of the top 10 international movers in Dubai. Looking for a way to make sure your move from the UAE doesn’t break your bank? This ServiceMarket guide will walk you through all of the key factors that determine the cost of moving from the UAE. It also includes the approximate costs of shipping your goods to various destinations across the globe. You can accurately estimate the cost of your move by answering the following questions. Air, sea or land? You can choose one of these modes of transportation, depending on your budget, distance from the destination and how quickly you want to move your goods. Shipping by air is the quickest way to transport your goods but it is also the most expensive option. On the other hand, shipping by sea is the cheapest option but your goods will usually reach their destination in 8 to 10 weeks. If you are planning to move to a destination within the UAE, then moving by land would probably be the best option for you. What’s the weight and size of your cargo? The second biggest factor you should keep in mind is the weight and size of goods you want to ship. You can minimize your expenses by only shipping the things that you really need. If you are moving by air, then the cost will depend on the total weight of your goods. For moving by sea and land the cost is calculated by measuring the total volume of all goods. Door-to-door: This is the most comprehensive service but it is also the most expensive option. The moving company will pack the goods, deliver them, and then unpack everything at your new home. In addition, they will also take care of the paperwork. Door-to-port: The moving service will be responsible for packing the goods in your home and shipping them to an international port. You will then have to handle the paperwork at customs and transport the boxes to your new home from there. Port-to-port: It’s the cheapest type of moving service in Dubai. The moving company will only ship the good from one port to another and you will have to handle everything else, including packing, paperwork and moving the goods from your old home to the port and then from the port to your new home. How far is the destination? Typically, the greater the distance to your destination, the more it will cost you – although there are some countries that have higher taxes and duties than others. 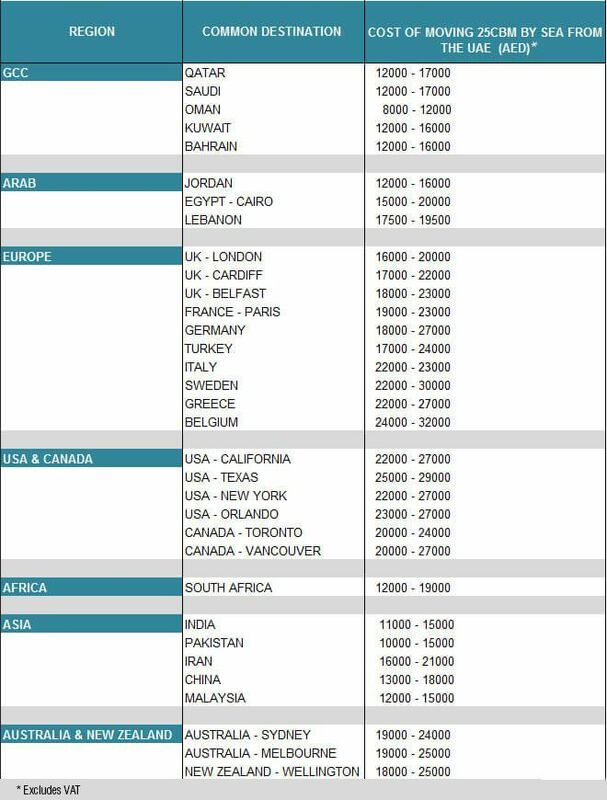 To make it easy for you to estimate how much it will cost to move from the UAE to some of the most common destinations around the world, ServiceMarket has put together this cost sheet. It features costs of moving 25 cubic meters by sea. A 25 cubic meter container can accommodate the contents of a two bedroom apartment. However, the exact cost will depend on the place you are moving to and the type of moving service. Did You Know There Are 3 Types of International Moving Services? You should always get quotes from multiple international movers in Dubai. Don’t forget to read reviews and compare international moving companies on ServiceMarket before making the big decision.